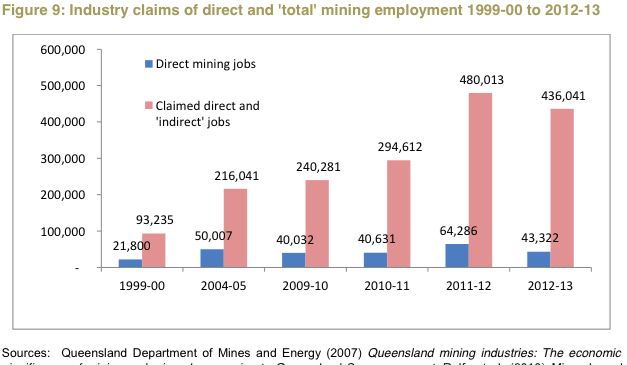 99 per cent of Queenslanders don’t work in coal industry. 96 per cent of Queensland government revenue doesn’t come from coal royalties. A slump in prices and Chinese demand will see revenue share sink to $1.68bn or 3.3% in 2015-16. In the same year, revenue from vehicle registrations will reach $1.65bn or 3.2% of total revenue. Despite the relatively small size of the coal industry, it is clearly able to make a lot of noise. In the Queensland economy, it’s the mouse that roars. Queenslanders think the coal industry employs ten times more people than it really does; and contributes five times as much revenue to the state budget than it does. If Queenslanders better understood actual size of the industry, and that it’s 80% foreign owned, it’s likely opposition would be <even> greater. ..vast majority – 85 to 90% – of coal Queensland produces is exported…Typically their reports rely on economic modelling that is mathematically certain to overstate their industry’s importance, modelling which has been described as “biased” by ABS(Australian Bureau of Statistics) and “abused” by Productivity Commission. Simplifying nature of Queensland economy to focus on a small number of industries is convenient for politicians trying to communicate their messages. Premier Newman expands view of state’s important industries to include not just coal, but also agriculture, tourism and construction…state’s “four pillar economy”. This is also a gross simplification…account for only 23 per cent of employment in the state and only 25 per cent of its economic output. State budget papers reveal contribution of fast-growing export industry, based on coal seam gas, is expected to remain less than 1% of total state government revenue in five years time. This entry was posted in Events local and tagged Australia Institute, coal, Queensland. Bookmark the permalink.